Everyday after class is over I go straight home because I want to rest for a bit. One day when I came home, my mom was more lively than usual. She said, “Do you have something to do this weekend?” I said, “I don’t think I have anything to do.” She said, “I want to take you up to the mountains for two days, is that ok?” I said, “Ok!” I responded that way because the last time we went to the mountains it was really fun. At that time I was very excited. She said,” Oh yeah, we will be running in a marathon as well, so much fun!” My feelings changed very quickly because I don’t really run. That next day I repeatedly told my friends that I didn’t want to go. I wanted them to help me get out of it, but we weren’t successful. I still had to go to the mountains. I was a little happy that they made me go when we arrived in Meinong as the place was so beautiful. But I still had to run in a marathon. My mom had told me that my father decided not to participate in the race so I could also opt out and sleep in. 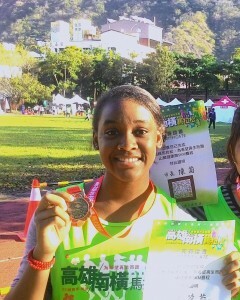 I was very happy because running the race would mean I would have had to wake up at 5:00 a.m. That’s so early! That same night my father decided he did want to run, so they asked me if I wanted to go now. I decided to go but I wasn’t happy about it. At that time it was already 11:00 p.m. and I would have to get up at 5:00 a.m. That would mean only five hours of sleep. The day of the marathon came and I woke up still tired at 5:00 a.m. I kept saying “It’s too early!” and my family continuously laughed at me. We got in the car and headed over to the marathon, I still didn’t eat anything because it was too early. When we arrived at the marathon site I didn’t want to get out of the car. When we arrived at the start of the race I changed my attitude because there were a lot of people. Everybody was very happy, and there were even little kids there. They were all excited and I thought that was great. 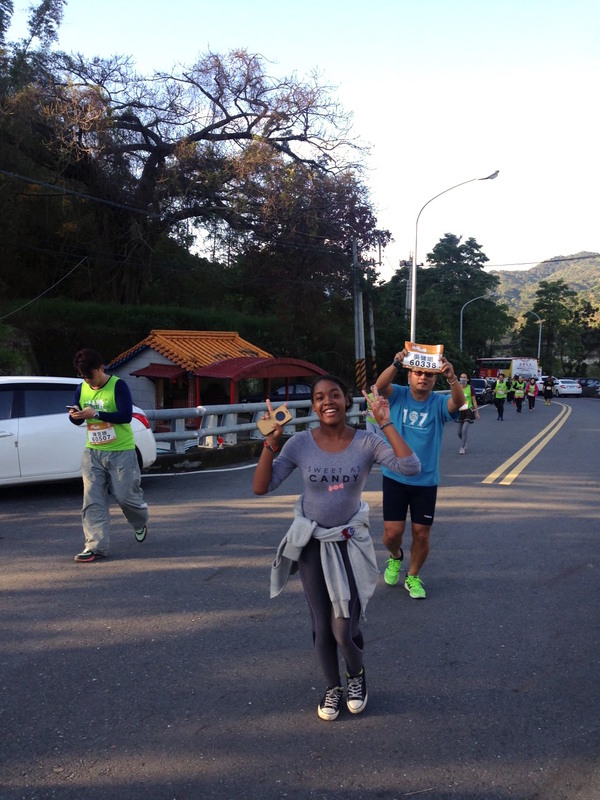 When we had started to run there were people on the side of the road cheering us on. It made me really happy. We reached the halfway point of the race and there were people giving us drinks. There was a Taiwanese lady there who said to me, “You’re really great! You came here by yourself to participate! Keep on going, you can do it!” That made me laugh. She was very nice. I decided to run all the way to the end. When I had almost finished I saw my mom on the side and I took a picture with her. I also ran into a group of indigenous Taiwanese who were on the side cheering people on. When they saw me they all got very excited and cheered me on very loudly. They made me very happy. When we were done running I decided to go back to the group and take a picture with them. I was starting to ask them and hadn’t completely finish talking, when they all rushed over to come take a picture. All of them! It was very funny. This experience has taught me that cultural immersion isn’t just in a class full of Taiwanese students, it isn’t just staying in the same city, or just talking. You have to really jump out of the box and explore. And when you look up you will find yourself saying you ran a marathon in Taiwan. Even if you only ran 5 km of the entire 42 km marathon, you still get a trophy and a story.